Serving cider with crêpes in France is a true tradition. Cider, or cidre, as we call it, is made from apples grown in Normandy and Bretagne (Brittany). Crêperies all over France serve cider, a key element in the tradition of eating crêpes. The Four Frogs offer a selection of exquisite French ciders to enjoy with your crêpes and galettes. We also serve our ciders in the bolée (a traditional wide ceramic cup) which makes it that little bit more refreshing. French cider is 100% natural and made from exclusive cider apples. It is usually more refined and fruity in comparison to Australian cider with a slightly lower alcohol content. The production of French cider. With a perfect climate of cool winters and mild summers, the Normandy and Brittany region is ideal for growing premium quality apples and in volume. Harvesting, hand-selecting and washing only the best apples mean that our ciders are crisp and refreshing. Transporting and storing the apples for a maximum of 48 hours before pressing means that we achieve the perfect balance of acidity, bitterness and sweetness. We serve two varieties of refreshing French ciders at The Four Frogs: the Kerisac cider and the Ecusson cider. 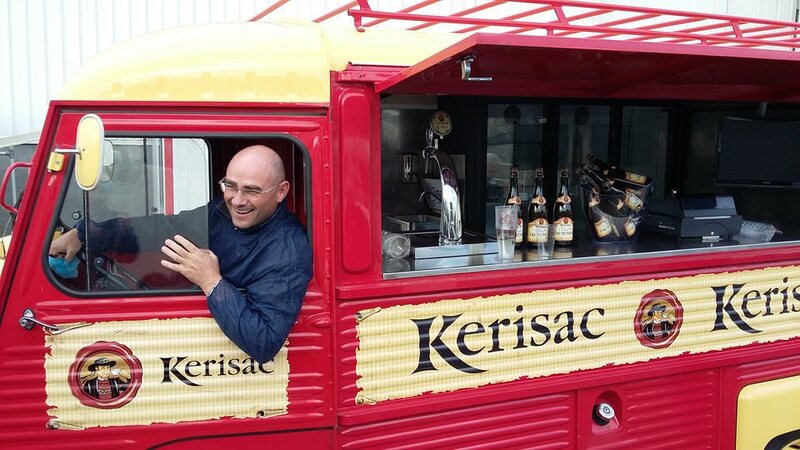 Kerisac cider masters take great care in selecting the best apples of their own orchards in Britanny. Using traditional juice extraction methods of grinding and pressing, Kerisac carries its unique and rewarding characteristic. In the heart of Normandy since 1919, Ecusson cider masters have created the most sophisticated French cider such as the Cidre Rosé. « La Maison Ecusson » reinvents French cider thanks to its original recipes. The natural quality of Ecusson shines through its commitment to sustainable farming. Above all, its expertise in its 100 years of cider making experience and the respect of its cooperative values. The difference between French and Australian cider. French cider is created using cider apples which are bittersweet and too dry for normal consumption. Adding no water or sugar, and using a fermentation process that’s 100% natural, we use only fresh apples without concentrate. In the winter months, mulled cider is the perfect comforting beverage to while away those cold winter days or evenings.